Ford created ripples in the Indian auto space when it launched the iconic Mustang here in 2016. The world famous muscle car badge was finally in India and although very expensive than the international version, it is still cheaper than most of the sports cars sold in India. Just to let you know, the Ford Mustang is sold in a single top of the line variant in India that is priced at Rs. 74.62 lakh (ex-showroom, Delhi). However, what if we told you that you can have your Mustang for much less than that. That too a car that is in very good condition and is just about 1.5 years old. The video below by My Country My Ride shows the same car about which we are discussing. 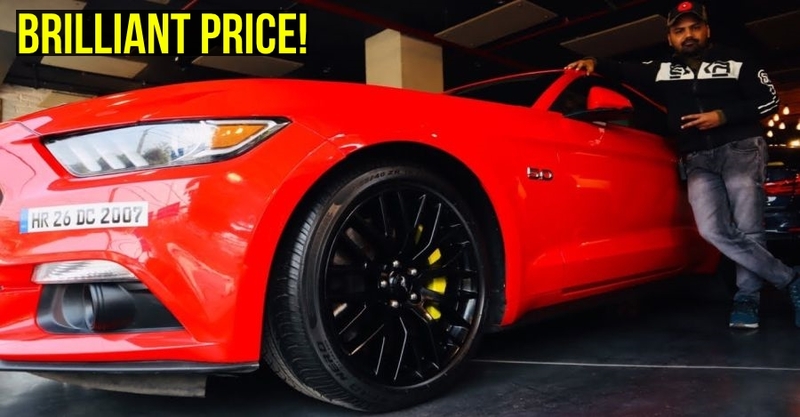 As seen in the video, the bright red Mustang has been kept in immaculate condition is as good as new. The asking price for this Mustang, according to the video is Rs. 54.75 lakhs. This is much less than the average used market priced where the Mustangs are available for an average minimum of about Rs. 60 lakhs. Also, the price listed here can be further bargained upon if you really plan to buy the car. The Mustang in the video is a 2017 model and has a reading of 26,000 km according to the video. The Ford Mustang is probably the most affordable sportscar one can buy in India. Another important bit here is that while other sportscars tend to struggle to ride on the broken Indian roads, the Mustang is a pretty practical everyday use sportscar. It offers a ground clearance of 137 mm, which is very decent when you compare with the other sports cars. Also, adding to its practicality is the fact that it is a front-engined car, which means it has a boot space like conventional vehicles. To be particular, the Mustang offers 408 litres of boot space, which is more than what many sedans and compact SUVs offer. The Ford Mustang sold in India is powered by a 5.0-litre V8 engine that churns out a maximum power of 396 Bhp along with 515 Nm of torque. This makes it the cheapest V8 engined car in India your money can buy. The engine comes mated to a 6-speed auto gearbox which channels powers to the rear wheels. To let you know, the Mustang sold in India has a slightly detuned engine as compared to its international counterparts. However, the almost 400 horses its V8 still produces are enough to set you racing in no time. One major peace of mind factor when buying the Mustang is its affordable and readily available after sales service. Ford even provides assistance in Tier-II and Tier-III cities where fully-equipped service centres are not located. It can seat two adults comfortably at the front while the rear seats can be used by shorter people or children. If you want to get in touch with the seller, please contact them according to the details given below.